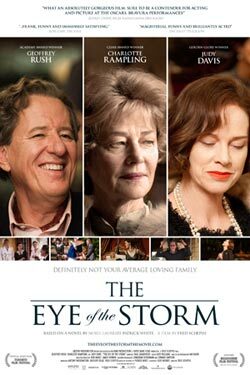 Sycamore Entertainment releases The Eye of the Storm in select theaters on September 7th 2012 at the Cinema Village and Lincoln Plaza Cinemas. NYC MOVIE GURU: How has your background in theater enhanced your performance in this film? Do you think that the film would work as a play? Geoffrey Rush: Patrick [White]’s very first novel, The Aunt’s Story, has been adapted to be created as a piece of theater. It, in fact, stars Helen Morse, the actress who plays Lotte in The Eye of the Storm. There are a number of actors in the film, like John Gaden who plays the solicitor, Wyburd, and Robyn Nevin plays his wife. They’re both great exponents of various Patrick White plays in Australia. They’ve done some very highly significant productions as have I, on a lesser degree. I knew him later in his life because I had been involved in a couple of his plays. Because the film is set in the early 70’s, that’s when I started as an actor, so I tried to find out from close friends of Patrick who he might of had in mind, particularly, when he was creating the character of Basil in that particular time frame. I talked to his biographer, but nobody seemed to give me an exact answer. I would have thought that there were a generation of actors who all migrated to England in the 1940’s, 50’s and 60’s. That’s what people did because we presumably had a kind of cultural wasteland [in Australia]. So there were actors like Keith Michell and Peter Finch. I don’t think that Robert Helpmann’s in there even though I put a little bit of him in my performance. [laughs] So I was looking at that generation of actors in their 50’s or 60’s that had come back from having had a career in Australia when I was in my early 20’s. NYC MOVIE GURU: what qualities were you looking for in the character of Elizabeth, played by Charlotte Rampling? Fred Schepisi: I had to find somebody who was beautiful and seductive. That was important. If you read the book, you could very easily play it where that woman was extremely hard and not bitter, but biting. Charlotte Rampling, when we were in rehearsals, just starting doing it that way, and I said, "Oh yes. That's so much better." That's really who the character is. She's seductive--as the she was just laing the there, the crew were all dribbling. Alexandra Schepisi: Even with that lavender wig! NYC MOVIE GURU : What important lessons have you learned as a filmmaker? FS: I'm still learning. I don't believe that audiences are stupid. I don't like catering down to them. The first film I did I remember seeing it ten years after I made it. I remember what it in front of an audience and I'm thinking, "Oh god. I did that twice because I didn't think the audience would get it." I've overstated it and you could tell. I've sat in audiences where you could hear people saying, "He's going to do this. She's going to do that. He's going to be back later and kill him." And all that sort of stuff. They're ahead of you all of the time, but I would much rather be ahead of the audience---not too far because otherwise you're going to leave them behind. There are certain times in a film when you can't take any more sideward turns because you've got people going on a path and then a little thought patters take place on the side, and at a certain point you have to bring it in. It's like shooting the arrow out of a bow: you have to go straight for the target. You will upset [the audience] emotionally. One of the things I've learned in America was to allow emotion to happen. Americans like to hang onto emotional moments much longer than I do. In Australia, if Geoffrey and I had an argument, before the argument would finish, you'd cut to a door slamming and you'd think it would be him walking out of a room when in fact it's another character walking into another room and taking their angst out on somebody. That's what I refer to as an intellectual cut because everybody knows what's going to happen and, therefore, I surprise them by taking them somewhere else. If you set American audiences up for an emotion, you've got to allow that emotion to happen otherwise you're shortchanging them. NYC MOVIE GURU : How helpful was the novel for you to get into character? GR: One of the things that you can't acheive in film language is going in and out of interior states of mind and then you'll suddenly hit a full stop and go, "Oh, now he's jumped back into third person narrative." or "Now he's back in Basil's head." It was great having the novel there because it was like having a special research bible where you could go, "What's Basil thinking over 20 pages here that I can use to help inform the qualities within this scene?" In the scene when he first goes in to meet his mother, there's about half a page of him just on his knees. There's one moment in there when his brain goes into an internal monologue. He's in a disconnected state having just come back to England from Australia, and not liking it. Patrick White writes about how Basil regresses to when he was like 2 year-old sitting in a high chair and wanting to be spoon-fed. There are many resonant emotional images in the novel. NYC MOVIE GURU : How were you able to shake off the character emotionally? GR: I'm the sort of actor that tends to generally hang the costume up at the end of the day and not live with it 24/7. Having been a great admirer of Lee Strasberg's method, it doesn't work for me because I'm fearful that if I'm in character all day, I might end up doing my best work at the craft services table. It's better to save it for when Fred Schepisi says, "Action!"